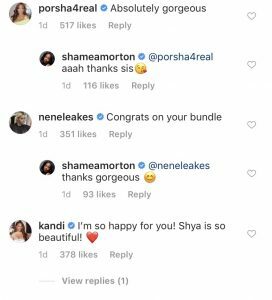 Real Housewives of Atlanta stars Porsha Wiliams, NeNe Leakes, and Kandi Burruss left congratulatory comments on Shamea’s post. 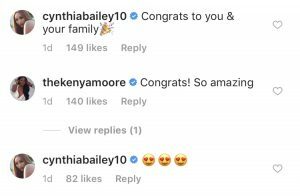 Atlanta Housewife Cynthia Bailey commented twice on Shamea’s big news. 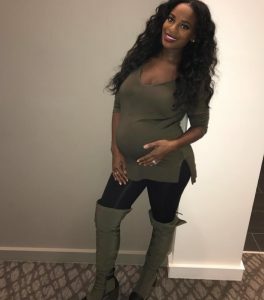 Former Real Housewife, and fellow new mom, Kenya Moore posted a comment. On November 30, Shamea revealed more information in another Instagram post. She wrote, “Hello World! Mee Shya Nyambura Mwangi.” She also revealed that baby was born on November 25. She was just waiting to get her an Instagram username and some professional photos (which we can’t legally post on this site without permission). Apparently, but for the record, baby Shya had that account before she popped out of the womb. It feels like there’s a baby boom in the ATL. Eva Marcille gave birth to a son in April. Kenya welcomed her daughter in November. Shamea just joined the mom club. Kandi might be the next RHOA cast member to welcome a baby. TELL US- WHAT DO YOU WANT TO SEE MORE OF SHAMEA MORTON ON REAL HOUSEWIVES OF ATLANTA? WHICH RHOA CAST MEMBER WOULD YOU WANT AS A MOM?